Our objective it to study important physical and biological processes using mathematical modeling, analysis and computer simulation. 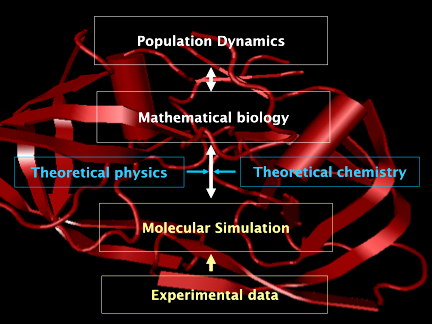 We model interactive population dynamical processes as infinite dimensional dynamical systems. can be used in a wide range of simulation areas, e.g. biosciences, materials science and would eventually contribute to public health and medicine. To obtain biological information from the stability boundaries of population dynamical equilibria in a two-parameter space. To enable efficient detailed simulations of extremely large and complex systems which are not possible with conventional simulation methods. Integral equations, semigroup theory and numerical curve continuation. Molecular dynamics, Monte Carlo, stochastic thermostats and shadow Hamiltonians.